Who will Play the Butcher? In 1997 after the Technical Staff Course of 18 months, I was posted back to my parent unit 75 Medium Regiment. In those days the unit had three batteries, each with different class composition of soldiers. Now it has men from all over India, comprising of all classes. A battery is a sub-unit of an Artillery Regiment consisting of six Guns and about 125 soldiers to operate them along with vehicles, radio sets and other technical equipment. The Regiment then had an interesting class composition. One battery was of Brahmins (other than those from the Southern and Eastern States of India), the second had Jats and the third was manned by the soldiers from the four Southern States. Management of soldiers in all the batteries differed as their reactions to various situations, their needs, their languages etc were different. In those days, any Young Officer posted to the Regiment would serve with each of the batteries for one or two years in order to make them familiarise with the soldiers. I too went through this rotation until I moved out for the Long Gunnery Course for 13 months. On my return from the course in 1990, I was appointed the Battery Commander (BC) of the Brahmin Battery. After two years I moved on posting to a staff appointment and returned after two years, again I was handed over the reins of the Brahmin Battery until I moved out for the Technical Staff Course. On my return to the Regiment in 1997 after the Technical Staff Course, the unit was located in the high-altitude area (10,000 feet above Sea Level) of Sikkim, where families were not permitted to live with the soldiers or officers. After the customary “Dining-in” in the evening at the Officers’ Mess, our Commanding Officer (CO) Colonel PK Ramachandran spoke welcoming me back into the fold and ordered me to be the BC of the Brahmin Battery. “Oh! Not again” was my instant reply and the CO was a bit puzzled. He later spoke to me in person and I requested that I need a change and I wanted to have the experience of commanding another battery. The CO had his own logical reasoning for his decision and I did accept the same without any remorse as I too got convinced. Col Ramachandran had earlier served throughout his army career with a Regiment which had only Brahmin soldiers and I realised the he exactly knew the “horse for the course”. The first week I spend at the Regimental Headquarters, carrying out the acclimatisation drills laid down for any soldier on arrival in high-altitude area. Our Battery was located about three km from the Regimental Headquarters. I luckily had two energetic and hardworking officers – Captain Samya Saurav, the Second-in-Command and Lieutenant Manish Wahi, the Gun Position Officer – both are presently Colonels, who effectively commanded their units. I delegated all my duties to the two and they did an excellent job that I hardly ever visited the battery. Our CO wanted me to stay with the Regimental Headquarters to assist him, hence I had to delegate most duties to my junior officers. After the week long acclimatisation, I decided to pay a visit to the Battery in the morning. When I reached the kitchen area, I found five goats there. 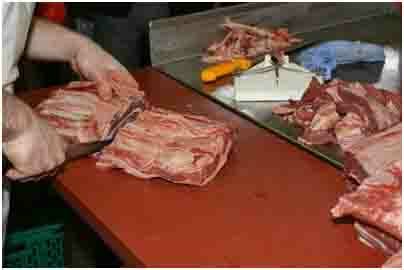 In high-altitude area, live goats are supplied as rations in place of dressed meat. These goats are called “Meat on Hoof (MOH)” but are mostly “Meat on Knees” as the goats are nearly dead after traversing through the difficult mountain roads from the plains. The soldiers usually feed them well for a week to bring them back to life before they are slaughtered. On inquiry I realised the problem of the goats – the Brahmins did not want to slaughter the animals, but like good soldiers, wanted to partake the meat. I ordered the Havildar Major (Sergeant Major) Kanti Prasad to assemble the entire battery at 12 Noon in front of the kitchen and the BC would slaughter the animal in their presence. After that I went back to my room in the Regimental Headquarters. In my youth, our household had fowls and animals and whenever I went on vacation, my brothers would entrust me the task of slaughtering. I think I did a good job of it as Amma, a stickler regarding the way the meat is cut, was pretty happy about my job. That was why I was sure that I would do a smart job of slaughtering the animal – if my mother could not find anything wrong – I was damn sure no one on earth could. By 11 AM, the Havildar Major knocked at my door and reported that the goat was already stewing in the pressure cooker and I need not return to the battery at 12 Noon.